Dicomano is situated 40 km. north east of Firenze. Casa Serena is a house which has recently been restored and rebuilt into four beautiful apartments. This agriturismo is on the outskirts of the village of Dicomano. 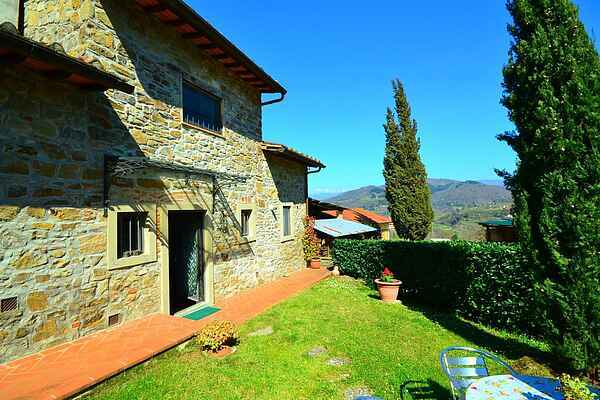 The house is surrounded by the beautiful valleys of Florence with forests and olive plantations, as a result of which you can enjoy beautiful views and a lovely climate. All apartments have a small garden with garden chairs, a table, a parasol and a barbecue. You can use a communal panoramic swimming pool blessed with a view of the valleys. By the pool you find sun loungers and small tables so you can lay in the sun and relax. Furthermore the agriturismo has a communal billiards room. You can use a covered car park (free of charge). You can bring small animals on request against payment of 5,- per night.